Larissa knows something odd is going on in her family’s antique shop in their small town at the edge of a Louisiana bayou. Each morning things are out of place. She finds stuffed animals in the glassware section. The locked case of antique dolls is open. Straw hats litter on the floor. A toy rests inside a rolltop desk. But none of this prepares her for what happens when an old phone hidden in the dim recesses of the shop’s second floor rings. 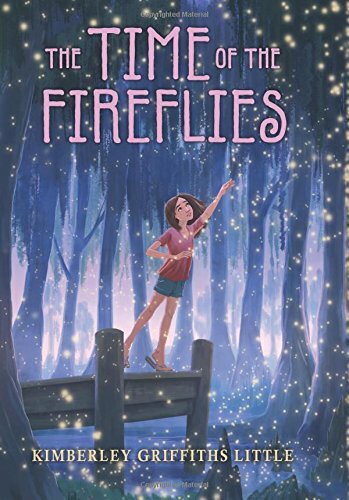 A girl’s voice tells Larissa to look for the fireflies, to trust the fireflies. Who is the girl? And how can a call go through on a phone that isn’t connected? A few evenings later, Larissa walks the short distance to a splintered pier that used to lead across the bayou to the ruins of the once-sumptuous island home her family owned long ago. Larissa knows the pier. She fell through the rotten boards a few months ago, nearly drowned—a terrible scar mars her face as a reminder. A cloud of fireflies appears from the vegetation at the swamp’s edge and leads her onto the pier. Seen in the fireflies’ glow, the pier is new again, repaired with fresh boards. The fireflies protect Larissa, hold her, carry her over to the island. To Larissa’s amazement, her ancestral home is now a gorgeous mansion as it was a hundred years ago. Larissa hides in the bushes watching 12-year-old Anna, her great-great-grandmother, directing a servant to dig for treasure beneath an ancient tree. When a beloved family uncle arrives from a trip to the Caribbean, it becomes clear the year is 1912. The uncle gives many gifts, including a pony, to the pampered Anna. He even has a gift for Dulcie, the servant’s daughter: a magnificent porcelain doll from Doll Island near Haiti. Dulcie treasures the doll, but greedy Anna soon snatches it from her and keeps it for her own for a servant’s child is in no position to object. Larissa receives more messages on broken phones. The girl at the other end of the line tells Larissa to look for a hint in the genealogy section of the family Bible. The girl warns Larissa that her mother and unborn sister are in danger. Larissa’s mother has already lost a baby and has been sick during this pregnancy as well. As Larissa learns more, she realizes tragic events have traumatized her family for five generations. Is the family cursed? Larissa, with the help of the magical fireflies, moves back and forth in time, searching for clues to undo the curse—for she is the only person who can make things right and ensure her family’s future. Set in the shadowy atmosphere of bayou country, where alligators prowl and cypress trees squat knee-deep in swamp water, Kimberley Griffiths Little’s exciting book gives us a spunky heroine determined to repair the curse that threatens her family. The mysteries keep unraveling until the final pages, leaving the reader well satisfied by a fine story.